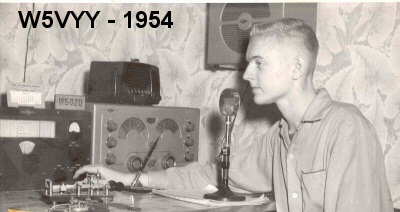 I was introduced to Amateur Radio in 1956 while in the 9th grade of Jr. High School when I was visiting a friend from school. 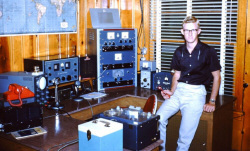 We went flying through his house and when we passed through the back room , I stopped dead in my tracks and there on one wall of the room was a mass of tall cabinets with meters switches and lights, reaching to the ceiling and his father was sitting at a desk talking into a microphone. 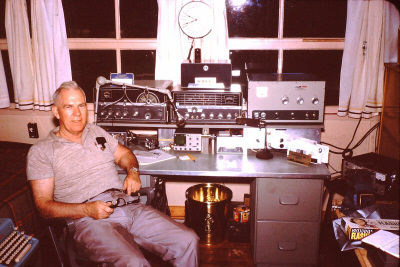 "CQ DX, CQ DX, CQ DX, this is W5LGH, Whiskey Five Little Green Horn." After he turned and spoke to me, he got a call from someone with a funny accent. He told me he was talking to a man in Africa!! No Way !, I thought. 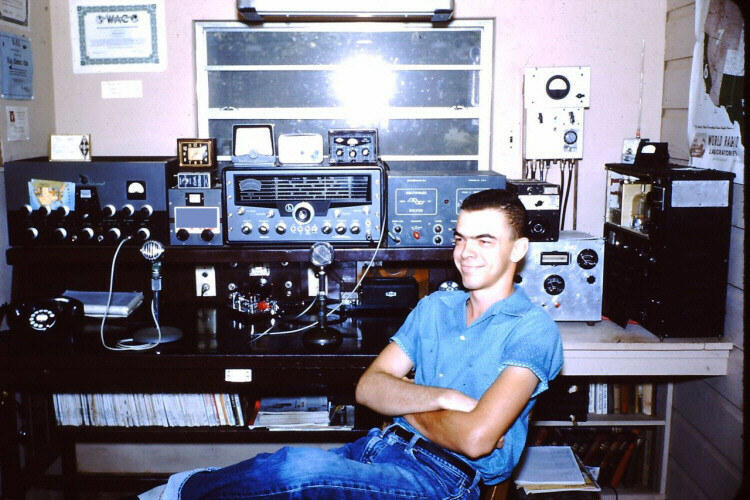 After a year or so in my bedroom as pictured at the top of the page, my mom suggested we make other arrangements for all the "Junk" so we built this Ham Shack addition on our Garage and this is a photo taken by my friend Johnny Gammon (W5VYY) when he came to Texarkana to visit in 1961. 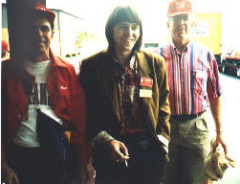 During my High School days at Texarkana, Arkansas , I spent my spare time between chasing girls and hamming. 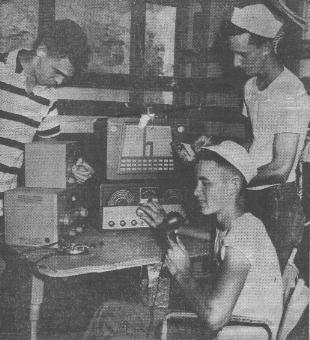 In those days (1957-1960), most of our local QSOs took place on 80 meters, after school & homework. 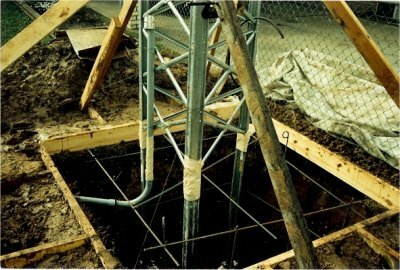 Let us never forget the old Nucklehead Net on 80 meters! 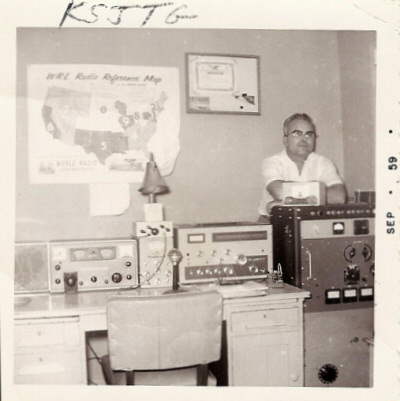 Two other hams that went to school with me: K5JBZ and K5VYL; on the other side of town in Texas were: K5KMX and K5AVH; in nearby Atlanta, Texas were: K5GAT and K5MFA; and in Bonham & Kilgore, Texas were W5VYY and K5BSY. We had a pretty large group and most all of us had met at hamfests or were close enough to visit. 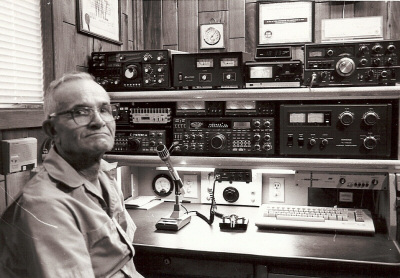 All of these guys except for one are still active and QSOs are few and far between but the memories will always be there! "R.F. Burns". RF is actually used now in Heart Ablation procedures in the O.R. of a hospital. 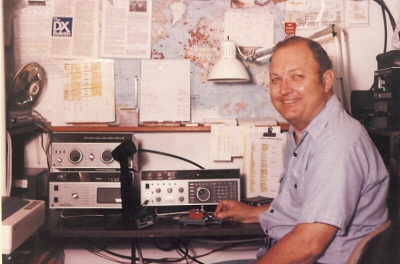 I have some fond memories of things that Amateur Radio led me to. One such event happened in about 1960/1961. It was pretty much standard practice to run Phone-Patches for service men and missionaries overseas back home to the USA in those days. There was no Internet or cell phones. The Phone Patch connected to the radio transmitter and receiver so the person on the telephone could speak to whoever I was talking to on the radio. I ran those phone patches numerous times from Africa, Europe, Pacific Islands to people in Arkansas/Texas and they only had to pay for charges to Texarkana. One day I got a call from a young lady (Pat) who wanted to talk to her Fiance' who was in the army at a base in the Canal Zone. I told her to write him a letter and set up a day, time, and I gave her a radio frequency to meet them on. (Watch the Movie "Frequency" some time). She told me she lived in Texarkana, Arkansas and when she gave me her address, we found out we were only a few streets apart. I told her she could come to the house instead of using the telephone whenever she set a day and time. In a few weeks she called me and told me she got an answer back and told me the date, time and the Callsign of the station in the Canal Zone and I told her I had talked to that station several times and they always had a Big Signal so it would be really easy to do. When that day came and the doorbell rang, my mom answered it and let her into our radio room. Wow, what a nice surprise I thought when I saw this tall beautiful brunette standing at the door. 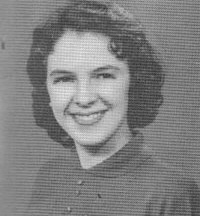 Oh well, I knew she was engaged so I just thought to myself... "Crap, just my luck" She told me she also graduated from Arkansas High as I did but in 1957. I graduated in 1960. "Wow an older woman, I thought!" 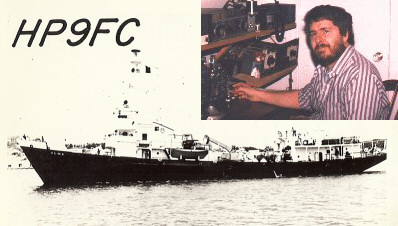 We called the station on the 15 mtr radio band on the exact frequency but I was surprised they never answered me after at least 30 minutes. I got several calls from other countries and started talking to them. We spent sveral hours talking to other people and I fugured if the CZ station heard me, they would break in. BUT they never did. She seemed pretty disappointed and puzzled so she continued to come over a couple times a week and we continued to keep the airways hot and the Antenna turned due south to the Canal Zone but always the same result and in the mean time she wrote another letter. She returned week after week and one day after getting tired of this calling and calling I had the feeling they would never call and she seemed to care less after a while. So, I spoke the Magic words "I dont think he wants to talk to you!" She then told me " I am sorry to keep pestering you but my fiance' wrote me back and told me he had found someone else a few weeks ago" HUH? A few weeks ago? I said "Why the heck are we still calling him?" What a surprise answer she came back with ! Yeah you probably have guessed...."You silly boy, I haven't been coming over here to talk on the radio!!!" "Although it is fun"....Well, I guess I was a little Naive! I reached over and hit the Big Switch - "Click!" She said why don't we go somewhere and talk, so we headed over to the A&W and had a frosty mug. We ended up dating for about 6 months and the word Marriage came up. I told her I didnt even have a job and had begun at Texarkana Jr College. No way I could see getting married but she was certainly ready! We finally stopped seeing each other but she was a great girl and we had good times. 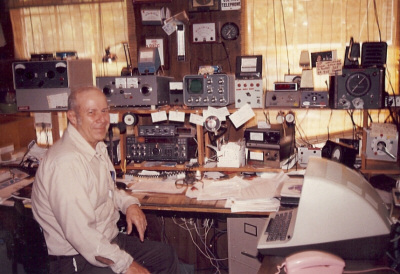 One of my Good Amateur Radio Friends was actually a New Yorker stationed at the Texarkana Air Force Radar Station K5FIO. 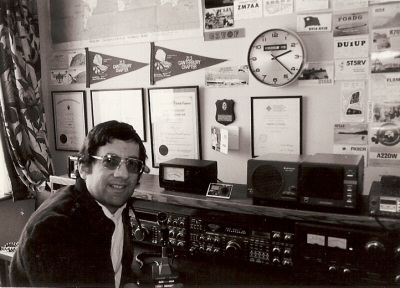 His Name was Jim (WA2GSX) and we often talked to each other on the radio when I got out of school or on weekends and also visited with each other in person. 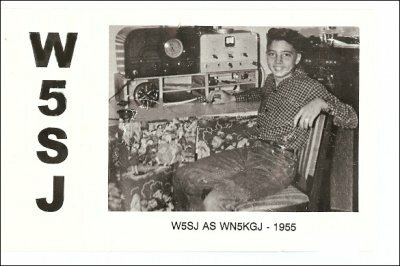 We usually had a large group on the radio that we talked to every day and one was a girl named Wilma (K5LSR) who lived in Haworth, OK which was not too far from Texarkana. Wilma was about 17 yrs old, I was 18 or 19 at the time and Jim was probably at least 21. He was over at my house one day and he asked me if I would ride with him to Haworth to see Wilma. He was dying to see her in person. My parents gave the OK and one Saturday afternoon we took off in his old 54 Ford. We made it to her house in good shape and met her and her parents. Her Dad was also a Ham Radio Opr so she had kinda followed in his footsteps. I will say she was a cute girl and Jim fell in love at first sight. We stayed pretty late since he couldn't make himself leave. I don't know how late it was when we left but it was so dark outside you could hardly see your hand in front of your face. WE started down that long, curvy and dark 2 lane Hwy to Texarkana and Jim had not even thought to look at his gas gage. "We gotta get some gas!!" he yelled. Pretty soon we saw an old broken down gas station and pulled in for some gas. We looked around and saw about 6 white eyes staring at us. They were black folks and they didnt move to pump any gas in our car. (No self service then) I didn't want to get out and neither did Jim. We waited a few minutes and Jim said he was getting out of Dodge now, gas or not. We just kept driving and praying we didnt end up on that dark road on foot. It was not a very friendly looking area. Thank God for letting us arrive in Texarkana on fumes! Needlessly to say, Jim made many more trips to Oklahoma but he didn't take me along! That wasn't fair, was it? In a few months my Dad and I and some other Radio ops drove to Oklahoma to a wedding. 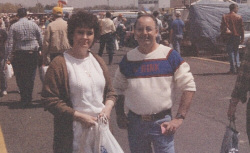 Jim and Wilma left Texarkana and moved to New York where they lived happily ever after. Wilma passed away a few years ago and Jim was left alone except for his kids and grandkids. 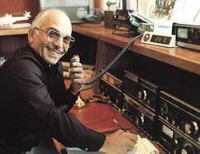 I called him about 10 yrs ago and we talked about that dark night and how much he missed Wilma. I haven't talked to him since. 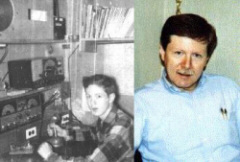 In the late sixties I became acquainted with Andy McClellan, VE1ASJ in New Brunswick, Canada. We talked quite often and then he got a job as radio operator on a research vessel and I began to follow him around the world. We stayed in contact all the way and after 2 years he came back home and bought himself a new Ford Mustang and decided to travel the USA and visit some of the Hams he had talked to over the years. He came to Pine Bluff-White Hall and stayed with us (me and wife #1) a few days and we showed him a little Southern Hospitality. Well, lucky us .....his New Mustang blew its Head and the Ford company in Pine Bluff had to order one so his visit became a long week. I think he fell in love with Cornbread and Purple Hull Peas which he had never had but we filled him up with them. I remember one late evening we were sitting out in the back yard and he started complaining about the noise in the trees. I said "What noise"......it turned out he was talking about the Locusts hollering. That was something he had never heard before and we were used to it and hardly noticed it. We spent a lot of time with the local Radio Ops and the week went pretty fast and the Ford company finally got his Mustang fixed and he was off again heading west. Andy and I have kept in touch ever since by either Radio or email. Oh yes, I remember him asking me one time where "Yonder" was located? 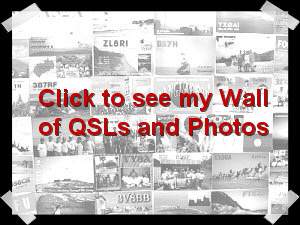 If you get out your magnifying glass, you might notice the W2DGW QSL above is for 27 mhz. This was a QSO from the 11 Meter WAS Contest which was a last desperate try by the ARRL to hold on to the 11 Meter band. It became the Citizen Band in 1958. 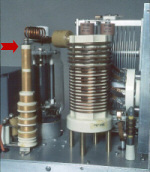 The one thing I remember about 11 Meters is the Noise from Hospital Diathermy Machines which operated on 27 mhz also. Even with this, I had a lot of contacts on this band and it was fun while it lasted. Let us hope this doesn't happen as mentioned in the latest Letter from the ARRL, dated September, 1996!!! 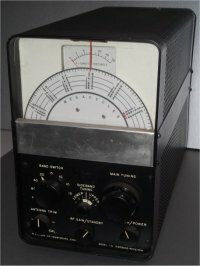 Donate to the Frequency Defense Fund! My first Field Day experience was in 1959 at Lake Texarkana (now Lake Wright Patman.) We setup our equipment on a hill top across from the Dam. It was a great location for our 1-A station which was set up in the back of a large Plumbing Truck (provided by the father of K5AVH.) The generator was placed some distance away in the woods. The Texarkana Gazette was notified and they came out for a visit and brought their photographer for our extra 100 points. The Photo (23k jpeg) appeared in the next mornings edition. The photographer placed me behind the VFO and told me to Tune it! I will never live down that photo! hihi. 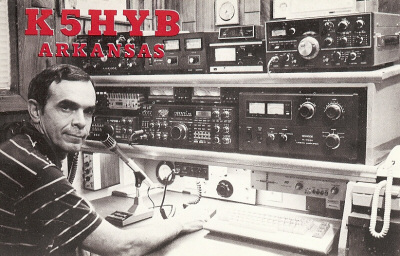 Left to Right, K5HYB on the left, K5KMX operating the Radio, and K5AVH keeping log. We had 5 or 6 operators that day and night with a lot of visitors dropping by and it was as much fun as the one I took part in, two years ago.